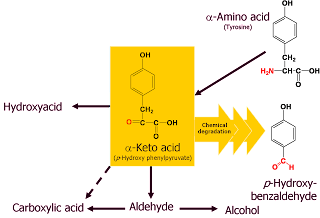 In addition to conversion to hydroxyacids by the action of 2-hydroxyacid dehydrogenases, alpha-keto acids can be decarboxylated to the corresponding aldehyde. In the example of the degradation of tryosine, its alpha-keto acid (p-hydroxy phenylpyruvate) is converted to phydroxy phenylethanal, which in turn can be oxidised to the corresponding alcohol (p-hydroxy phenylethanol) or reduced to the corresponding carboxylic acid (p-hydroxy phenylethanoic acid). alpha-Keto acids can also undergo a series of chemical degradations leading, in the example of tyrosine to products such as p-hydroxy benzaldehyde.